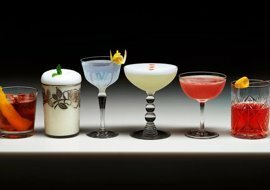 It seems like every few months there's a new trend in cocktails, and according to the online magazine PUNCH, the latest is cocktail glasses. Everything — from vintage coupes to tiki glasses to the beautiful copper mugs for Moscow Mules — is fair game these days. PUNCH makes the point that most glasses were designed the way they were for a specific reason. Collins glasses are designed to hold lots of ice, coupes to prevent you from having to hold a cold glass, and ceramic Tiki glasses to camouflage drinks that were often dark and muddy by virtue of their ingredients. Sunny Glassware with more than 20 years experience in glassware field , specializes in glass tumbler, glass perfume bottle ,glass candle holder ,ect .